Editor’s note: This is a revised version of the original review. Audience members know they’re in for a funny evening when even the pre-show announcement about fire exits and cell phones draws laughs. That’s the case with SRO Underground’s production of Avenue Q, which opened last weekend (May 12-14) at the Schorr Family Firehouse Stage in Johnson City. The laughs continue throughout the two-hour and 15-minute show that is basically a spoof of the beloved children’s series Sesame Street, replete with fuzzy puppets and actors pulling the strings. The performance is funny and enjoyable with a highly skilled 11-member cast making the most of the clever material. The 2003 musical stands out as one of the biggest sleeper hits in Broadway history. To the surprise of almost everyone, it beat out Wicked for the Tony Award for Best Musical in 2004. The show, with a book by Jeff Whitty, tackles some pretty heavy topics. Racism, closeted homosexuality, the struggles of young adults and the erosion of the American dream head the list. But it’s done with a light touch that proves the old adage, “You catch more flies with honey than vinegar.” The songs by Robert Lopez and Jeff Marx remain as tuneful as ever while the concept of having puppets interact with human characters remains fresh and inventive. Moreover, Avenue Q is a delightfully offensive poke in the eye against uptight political correctness. The plot centers on Princeton, a recent college graduate, struggling with the mundane issue of paying his bills while trying to find a higher purpose is life. He moves into a rundown block in New York City where he meets assorted characters, including Rod, a repressed gay Republican; his roommate, Nicky; Brian, a genial deadbeat; Christmas Eve, his Asian girlfriend; Gary Coleman, the former child star who is the building’s superintenden,; and Trekkie Monster, whose potty mouth and raunchy comments provide a lot of laughs. Along the way, Princeton falls in love with Kate Monster, a kindergarten teaching assistant and the show’s other main character. All this sounds silly, of course, and Avenue Q needs a strong cast and strong direction to make it work. SRO Underground has both. The performers have good comic timing and sing well as they put across the politically incorrect songs and cheeky dialogue. They also have great chemistry, something that is absolutely essential. Kudos go to Scott Fisher, who did the stage and musical direction, and Annie Fabiano, his assistant. Especially noteworthy is how well the performers work with the puppets. Fisher brought in Rick Lyon, who conceived and designed the original Broadway puppets, to work with the cast. The decision and, I’m certain, hours and hours of hard work paid off. The coordination is really remarkable. Nonetheless, I have some issues with the SRO Underground production. In a few spots it goes over the line from humorous raunchiness to sophomoric bad taste. Also, Avenue Q takes place in a neighborhood that is supposed to be a mixture of ethnicities. Racial prejudice is one issue touched on in the show. I would have hoped for an even more diverse cast. This issue aside (and I’m perfectly willing to admit it’s a debatable point), Avenue Q provides a wonderful evening of entertainment. The entire case deserves applause. They are Sean Sherwood (Princeton), Lindsey Boyer (Kate Monster), Eric Bill (Rod), Mickey Woyshner (Nicky), Josh Smith (Trekkie Monster), Laura Liburdi (Lucy), Annie Graham (Bad Idea Bear), Caitlin Westfall (Bad Idea Bear), Jimmy Massar (Brian), Elaine Laramee (Christmas Eve) and Amoreena Wade (Gary Coleman). The set design by Gene Czebiniak is also first-rate. The small orchestra of Vicky Gordon, Paula Bacorn, Tommy Iafrate, Joe Hoffman and Robin Warner provided great accompaniment. Avenue Q might not be the ideal neighborhood, but it’s one of the most joyful. The Skirmisher by Robert Aitken depicts a typical infantryman of the Spanish-American War (1898). 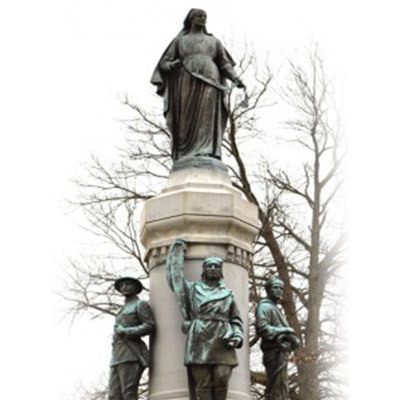 The monument was proposed by Thomas H. Barber Camp III as a tribute to fellow soldiers. 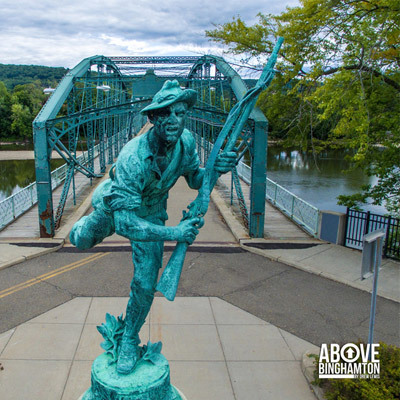 Foster Disinger, a Binghamton based photographer and an officer of the Broome County Historical Society, enlisted the help of his friend Robert Aitken, an internationally recognized artist, for the project. Aitken, who was also a veteran of the Spanish American War, decided against the typical stationary soldier, which he felt to be lifeless, and instead gave the Skirmisher his distinctive dynamic stance. Skirmishers were men deployed in a military formation called the skirmish line, which required each soldier to charge into battle at a distance of eighteen to twenty feet from each other. This unusual formation aimed to counter the increasing accuracy use of rifles in military conflict. Aitken’s Skirmisher balances on one leg atop a nine-foot cylindrical pedestal. The lively character resembles closely the men who charged forward into battle, aiming to capture the passion and dedication of the turn-of-the-century American soldier. 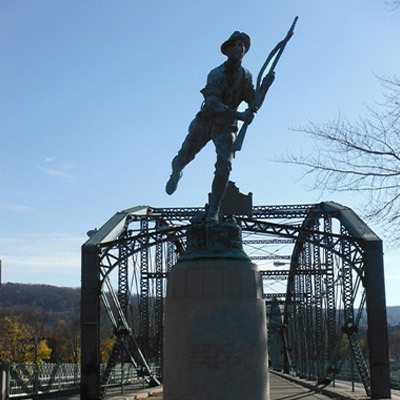 Binghamton residents were quite proud of the Skirmisher when he was he was dedicated in 1925, and aimed to make sure the sculpture with its unique stance remained unique to the city. According to Tom Cawley, writing for the Binghamton Press and Leader newspaper in 1967, residents of Brooklyn, New York, wanted a Skirmisher of their very own, but Aitken refused them. Indeed, the artist was determined to make the Broome County sculpture unique in every way. This local pride extended even to song: “Throw a kiss [to the Skirmisher], in memory of the men we still miss,” was a rhyme popular with children of the 1930s and 1940s and intended to keep the soldier’s memory alive. 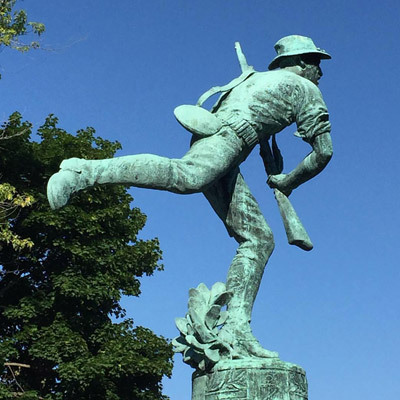 Installed in 1924 and dedicated on July, 1925, during the annual parade of the United Spanish War Veterans Convention, Aitken’s sculpture has had an interesting post-installation history. 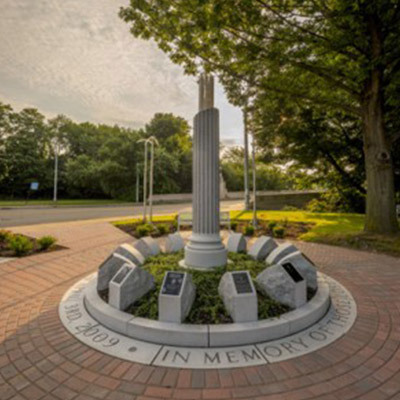 It was initially part of a larger memorial plan, a Memorial Circle with a diameter of 260 feet at the intersection of Washington and Water Streets (later North Shore Drive) and purposely close to the World War Memorial Bridge of Broome County. In 1958, the sculpture was moved six feet north and the circle diminished to accommodate the increase of traffic from highway construction; the remaining circle was removed when the bridge was closed in 1969. During the sculpture’s most recent relocation to Confluence Park in 1996, a time capsule was discovered within its pedestal. The time capsule, a copper box, showed signs of damage; the items found within the capsule included newspapers from 1925, Spanish American War badges, and a letter from 1958 explaining that the time capsule had been found within the pedestal during the relocation and replaced. It is believed that a new time capsule was placed within the base of the sculpture including its previous contents from 1925, 1958, and objects from its unearthing in 1996. 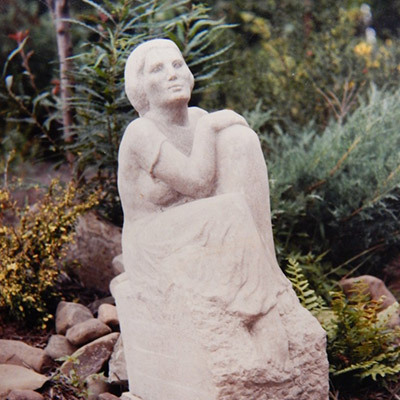 Arline Peartree attended SUNY Albany to receive her BA and MFA in sculpture. Art has always been her passion. Her art is inspired by post-1900s art such as Persian art, Indian art, industrial design, fashion, dance, and music. It is art that “gives life poetry in visual forms.” What you see here is the artist’s first large-scale commission. 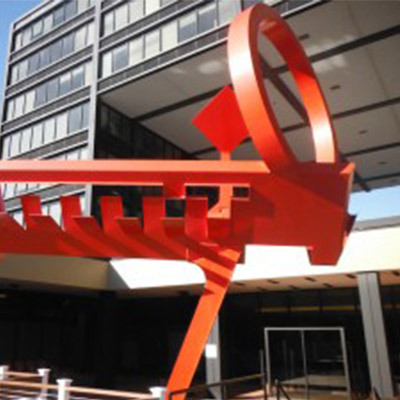 Located within the courtyard of the 20 Hawley apartments, previously Marine Midland Plaza, stands a red-orange steel sculpture that captures pedestrians’ attention from beyond the gates. The artist was supplied with the architectural plans of the “Marine Midland Plaza” before it was built, in order to design her commission. She then made a model of the plaza and designed her artwork, evoking drama, energy, and uplifting emotions. 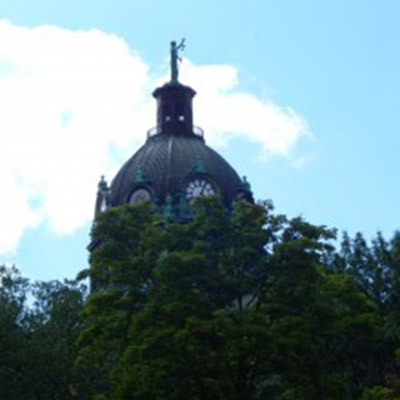 Once her design was approved, she oversaw the welding of the steel in Stephentown, NY. It was then shipped in 3 pieces on a large truck and assembled in place with the help of a cherry picker crane and three men from within the plaza. The support emerges from the earth at a 45 degree angle in order to support the horizontal beam twice its size. Crowning this prominent piece is a large open circle with square and cube forms. Originally the artwork was flanked by two still fountains that have since been morphed into the amenities of the apartments. Since creating this piece, the artist has developed more geometric and lyrical sculptures, as well as paintings on metal, water colors, and acrylics. Her work is never realistic but is concerned with abstraction, emotional mood, and sincerity of materials. You can find her entire body of work on her website. At noon on a rainy day in September 1920, the Workers’ Memorial was dedicated in Endicott Veterans Memorial Park. 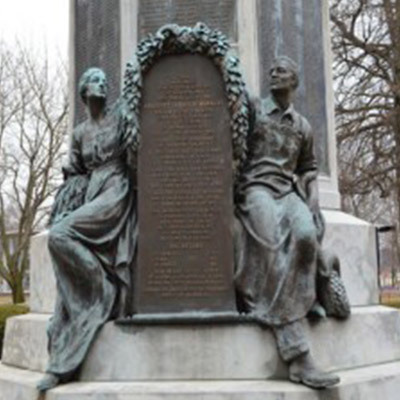 The memorial commemorated the contribution of Endicott-Johnson Company workers’ during World War I. The workers’ efforts had been famously substantial: E-J factories supplied every military boot for the United States army during the war, while the workers themselves raised over five million dollars toward the war effort. At the dedication ceremony, Endicott Johnson president George F. Johnson, who had commissioned the memorial, said, “unique indeed this shaft does honor to a people rarely honored in this way: the plain worker, the average citizen, the backbone of the Nation.” Johnson might have added “immigrant” to his list of honorees, as over twenty countries of the world were represented at the unveiling of the monument. Thousands of workers and community members gathered in song and prayer for the unveiling, the highlight of which was a “twenty-one bomb salute” punctuated by twenty female E-J workers, dressed in costumes specific to their home countries, pulling away twenty ropes tied to the flags to reveal the thirty foot monument beneath. 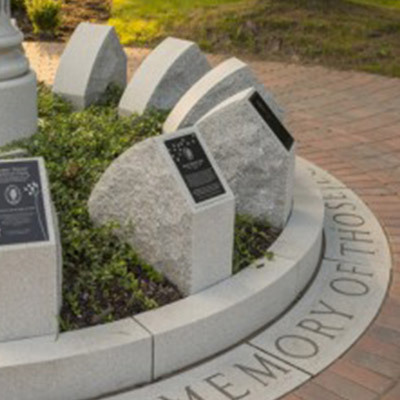 Aiming to symbolize the simplicity, dignity, and sacrifice of the Endicott Johnson workers, the memorial commemorates both the 1, 710 employees deployed in active duty and the workers who remained stateside and contributed to the war through their labor. The Italian artist Giuseppe Moretti, who had relocated to Pittsburgh, carefully sculpted the monument, which faithfully reproduced sketches that were drawn up for a design apparently created by Johnson himself. The upper section of the monument honors those in active duty. 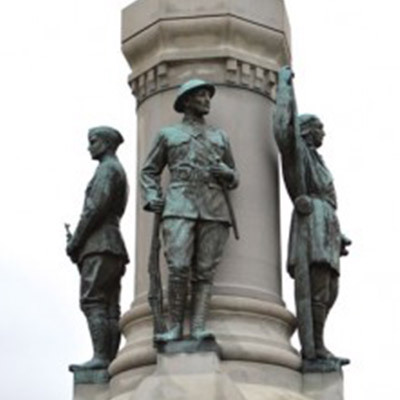 Four life-size bronze figures represent four branches of the military, each dressed in uniform. Moretti’s attention to detail adds the realism of the figures: the aviator holds a propeller and field glasses, the sailor an anchor with chains, the infantryman a rifle, and the marine a rifle and sword. “I’d rather be right than be president,” said Daniel S. Dickinson (1800-1866) at the Democratic Convention of 1852 in Baltimore. Although he was never President of the United States, Dickinson was elected president—the first president of the village of Binghamton in 1834. Dickinson enjoyed a distinguished career as a politician and lawyer which included positions as New York State Senator, Lieutenant Governor of New York, New York State Attorney General, culminating in his election to the U.S. State Senate. He was regarded with great fondness by those who knew him for both his eloquence as a speaker and his persuasive skill; his graceful speeches frequently included both allusions to poetry and mythology, and he could denounce his opponents with scathing satire. 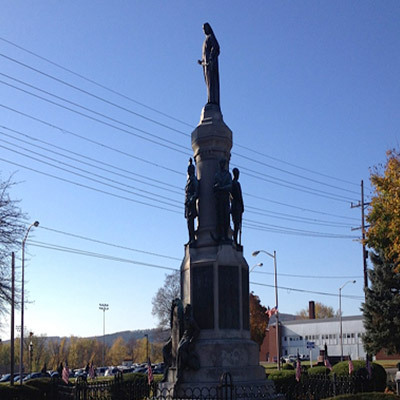 The project to erect a statue of Dickinson was initiated in 1915 by the Exempt Fireman’s Association of Binghamton, a group of distinguished volunteer firemen, led by the organization’s secretary, Charles F. Tupper. Tupper enlisted the help of his friend, architect John Hemingway Duncan (1855-1929), New York based-but Binghamton-born, to find a sculptor who could portray Dickinson as accurately as possible. Duncan communicated that it was important for the public to be pleased with the statue, and thought that Allen George Newman (1875-1940) would be the best man for the job. Newman was born in New York City and studied at the National Academy of Design with John Quincy Adams. Newman was well known at the time for his patriotic monuments, the most famous of which is The Hiker, a monument to honor American soldiers who fought in the Boxer Rebellion, Spanish American War, and Filipino-American War; copies of the famous Hiker can be found in parks and squares across the country. Newman’s statue of Dickinson was unveiled by Harold L. Harrington, Dickinson’s great-great grandson, on May 30th, 1924. A highly traditional monument, Newman’s sculpture portrays Dickinson as a grand, larger-than-life figure. The statesman holds a confident stance, his right hand tucked into his waistcoat and his left hand at his side holding papers. The hand in the waistcoat signifies boldness, tempered with modesty, a fitting gesture for a politician of Dickinson’s stature. Kennedy as a “very committed man” who created a “healthy atmosphere around the principle of involvement and commitment.” The memorial was completed in 1969; Wilson remained in Vestal until his death in 1996, at age 71. The assassination of President John F. Kennedy occurred on November 22, 1963. Though his term as president was brief, Kennedy left a lasting impact on an America that was just beginning to struggle in earnest with the poisonous legacies of racism. The president spoke eloquently about civil rights, and helped put into motion legislation that would become the Civil Rights Act (signed into law the year after Kennedy’s assassination by his successor Lyndon B. Johnson). The Seven Seals of Silence is a monument dedicated both to Kennedy’s memory and to the matters of justice, fairness, and civil responsibility that were major themes of his presidency. The Seven Seals of Silence is a three-sided monument standing ten feet tall with a granite base. 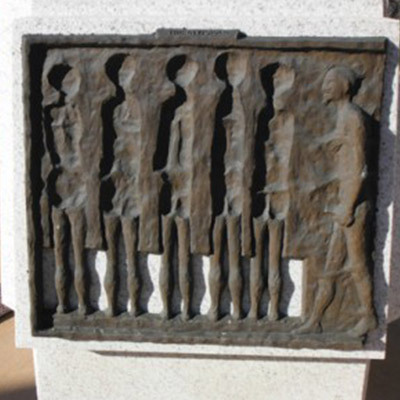 Attached to the three sides are a total of twelve bronze bas-relief plaques. Particular effort was taken in the positioning and design of this monument such that the sun shines on two sides of the monument at all times, leaving one set of reliefs in darkness. from above and below. The next seal shows two figures out of equilibrium with themselves and with other people. The seal is separated into two bronze plaques titled “The Rejected.” On one, the figure is shown off-balance, in a whirlwind. The second has the figure watching the imbalance of his counterpart. “The Depraved” is meant to symbolize absolute negative involvement. The three figures are contorted in powerful writhing of misdirected pleasure. The seal titled “The Invisible” displays the hollowed out bodies for six figures gathered in a line awaiting assessment on judgment day. One figure remains, preparing to enter into the realm of non-existence with the other figures. The final seal on the monument is titled “The Dead.” It is separated into two bronze plaques; one resembles a mass of blurred forms while a body lay on the plaque below seemingly deceased. Through these reliefs, Wilson has portrayed the consequences of seclusions from everyday life. These plaques are designed to encourage the development of one’s self, as well as inspire individuals to take initiative and act on their beliefs in order to guarantee a positive movement forward. The title Cono Tronco translates from Italian into “truncated cone,” referring directly to the work’s physical form. 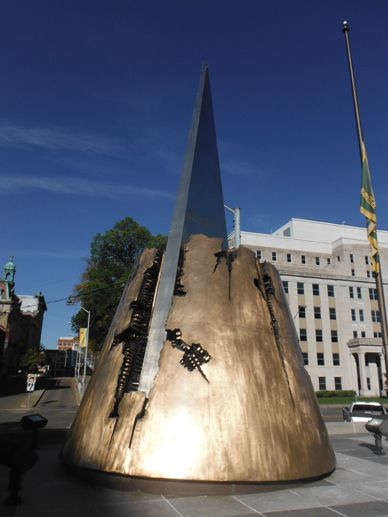 Here, a bronze cone is ruptured violently by an enormous triangular stainless steel blade; evidence of the cone’s elaborate “insides” appear to have been made visible in the process of the rupture. Pomodoro’s work often grapples with the dichotomy of interior versus exterior, and Cono Tronco is no exception. The steel triangle that protrudes from the broken cone can be understood as the interior “soul,” as the artist calls it, while a sharp formal tension emerges through the opposition of the large, smooth exterior geometric shapes and the work’s obscured chaotic interior. Cono Tronco weighs a staggering nine thousand pounds and stands sixteen feet tall. Like most of Pomodoro’s work, it was created through the lost-wax process, an ancient technique that can produce brilliantly modern results. Pomodoro makes his lost-wax works following an elaborate multistep process. After initial designs are created on paper, he then creates full-scale clay models in his studio. These large clay forms are then used to make hollow plaster molds, which are meticulously retouched and enhanced after the clay is removed. Next, the plaster molds are taken to an offsite to make the bronze casts. Multiple layers of wax are carefully painted onto gelatin molds made from the plaster; the wax is then encased in a mixture of plaster and silica, and subsequently baked to liquefy the wax, which melts away, leaving a void. The liquid hot bronze is then poured into the mold, replacing the “lost” wax. The encasing layer is removed after the bronze cools, and the bronze is polished and cleaned to Pomodoro’s specifications. The artist is an active participant throughout this process, engaging in every stage of creation and meticulously retouching and adjusting at every possible point. When Cono Tronco was originally installed at Governmental Plaza in 1973, it was not in the middle of a parking lot. Pomodoro encourages people to interact with his sculptures—to climb on and rest against them, or to peer deep into their mysterious interiors. Unfortunately, in its current site, this interactive dimension is largely lost for viewers. 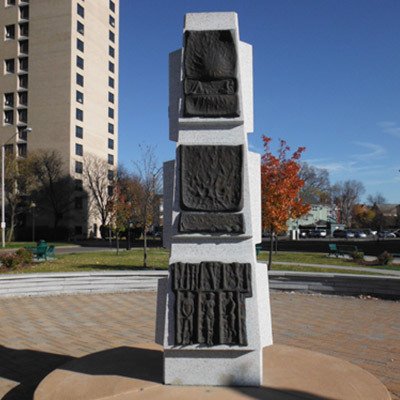 Dawn’s Column, completed by Louise Nevelson in 1970 and installed in Binghamton’s Government Plaza in 1973, reflects the artist’s commitment to abstraction, her background in constructed sculpture, and her interest in imbuing her art with a sense of spirituality. Nevelson was influenced early in her career by the early twentieth century avant-garde art movements of Cubism, Surrealism and Geometric Abstraction, and Dawn’s Column bears marks of each of these influences. Like a cubist collage, Dawn’s Column is as much about the spaces outside, within and around its forms as it is about the geometric forms themselves. According to Nevelson’s biographer, Laurie Lisle, the artist once boasted that “Picasso had resolved the cube, Mondrian had flattened it, and that she had endowed it with poetry;” Dawn’s Column is a tribute to this poetic manipulation of Cubist form. Witness, in this piece, the play of light and shadow across matte metal, and notice how it changes as you circumambulate the base. Think here of the sculpting of shadow as much as the sculpting of metal, and how these shadows constantly change throughout the day. The shadows themselves give the work an air of mystery, akin to Surrealism. Finally, although Nevelson’s composition of found objects might initially appear random, the work’s monochromatic finish unifies it, a technique Nevelson used often throughout her long and prolific career. 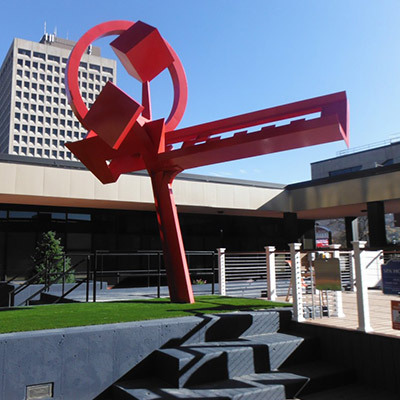 The rather stark and remote concrete plaza in downtown Binghamton might seem an out-of-place setting for a sculpture by a famous artist, but it actually accords with Nevelson’s life-long distrust of nature. The artist preferred the manmade to the organic; on her own property, she famously constructed a “garden” out of mechanical found objects in place of plants. The base of Dawn’s Column uses manmade materials to invoke the natural world. While the pedestal beneath most sculptures is only functional, the pedestal here includes thoughtfully placed white pebbles which against a dark ground of concrete, becomes a kind of “pool” reflecting the starry night sky. 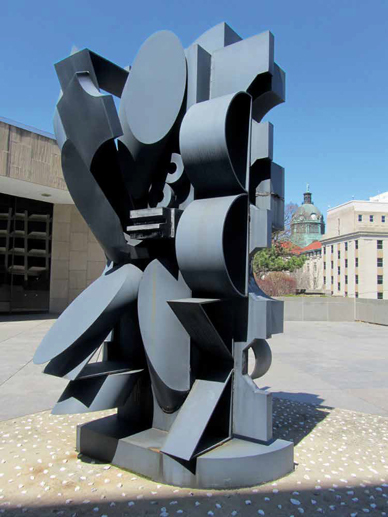 In place of an actual reflection caused by nature, Nevelson offers her own version, supplanting even Mother Nature, suggesting the ego for which she was famous. 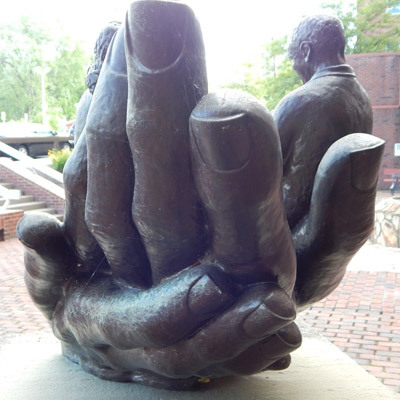 Supporting Hands was designed to symbolize donor support to the United Health Services Foundation. 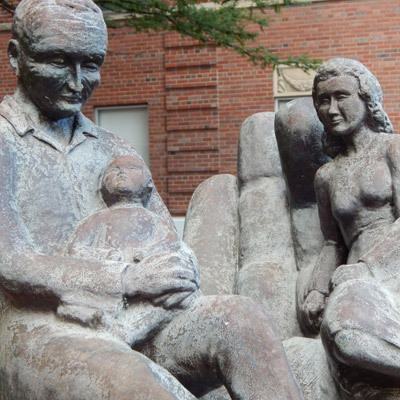 Located in the outdoor courtyard at Binghamton General Hospital, the sculpture is a permanent tribute to those who have demonstrated their generosity to the UHS. 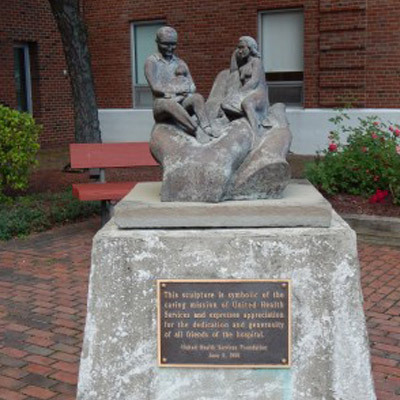 Artist Yvonne Robare Hobbs was commissioned, June 25, 1985, to design a sculpture to symbolize the caring mission of UHS, while recognizing donor support to the Foundation. Supporting Hands is composed of a young right hand supporting an older work worn hand. Seated upon these hands is a group of figures: a grandfather, child, and mother indicative of the need for cross generational interaction for mutual benefit. Further demonstrating the importance of those who venture before us, the artists used the lost wax process, which dates back to 4000 B.C.E., to achieve the detail present in this sculpture. This technique requires time and effort which was another form of donation to the UHS. First, Hobbs created maquettes in order to create her desired illustration. They would later be used to scale to the appropriate size. When the full scale model was finalized, it was sectioned off in order to make removable, reusable, rubber molds. Once the molds were created they were assembled and connected using several layers of liquid wax. When the wax shells hardened they were removed and reassembled. The next steps included draining the wax, pouring the molten metal, and making sure the system was properly vented. The burn out took place over a few days. Then the molten bronze was poured and allowed to cool down overnight. Finally, the surface patina of acrylic resin was added through the application of heat and chemicals. Yvonne Robare Hobbs achieved a MFA in sculpture with honors from the School of the Art Institute of Chicago. She also received a BS in art education from SUNY Buffalo, New York. The recipient of many awards and honors, Hobbs has exhibited her work in individual shows at such prestigious galleries as Cape May County Art League, NJ and Studio School and Art Gallery, Binghamton, NY. She also participated in the Imagination Celebration located in Binghamton, NY. Hobbs’ work reflects and is influenced by her belief in the interrelationship of all elements in our environment. Using wax as her primary material, she is able to develop and refine her ideas to allow others to visualize the interrelationships apparent to her. 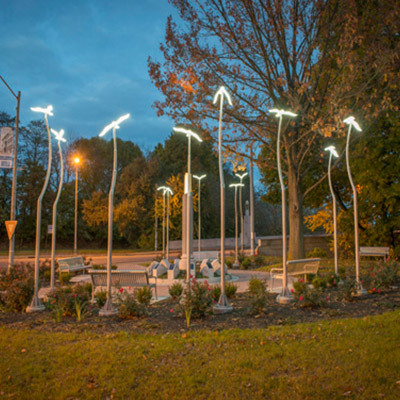 The High Place #62 was a gift from artist Genevieve Karr Hamlin to the Harpursville Central School District. It was installed in an outdoor garden area and later vandalized. The head was stolen and was never recovered. The damaged piece has since been moved to a public area indoors. Vandals, the weather, and inadequate maintenance are constant threats to outdoor public sculpture. Fortunately, most of Karr Hamlin’s public work is displayed indoors. 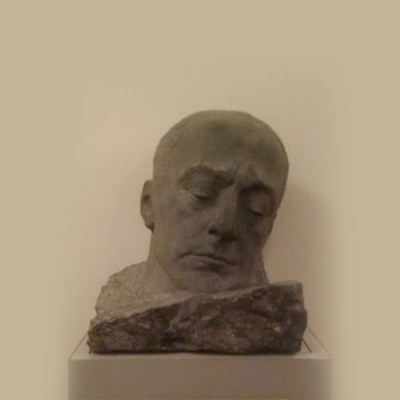 The Broome County area is home to many of her works, including her bluestone bust of renowned violinist Jasha Heifetz in the Forum Theatre in Binghamton. 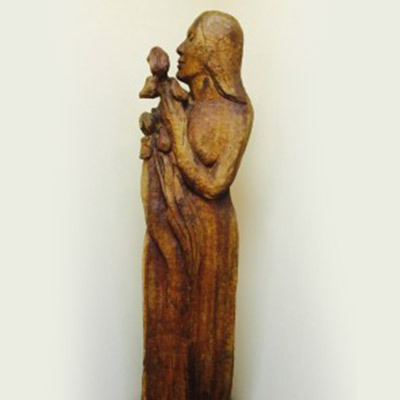 Her life-sized, carved wood sculpture Iris Woman Cherry, is on permanent display in the Broome County Arts Council’s gallery space. Both pieces were included in a 2008 retrospective at the Roberson Museum and Science Center. The show Genevieve Karr Hamlin Sculptures featured hundreds of her sculptures, bas reliefs, and carvings loaned by family, friends, and by public and private collectors. Genevieve Karr Hamlin was born in 1896 to Alfred Dwight Foster Hamlin and Minnie Florence Marston, a well known New York family. She studied art at Vassar College and continued her studies in Paris and New York City where she kept her studio until 1943. She became extremely interested in the continuation of art. At the grand opening of the Oneonta Community Center, where she was one of the founders, she said, “America doesn’t have a national art, to have one; we must have art centers in every community in the nation.” She spent the last 45 years of her life in Harpursville, NY, teaching classes at Hartwick College and at the formerly named Roberson Center for Arts and Sciences and founded many arts centers and galleries in her spare time until her death at age 93 in 1989. Quatrain was commissioned by SUNY Broome Community College to commemorate its fortieth anniversary. The sculpture is made of hollow stainless steel; stainless steel is highly functional for public sculpture, given its durability. The steel here was forged and then polished with a grinder, endowing the sculpture’s steel a smooth surface with a type of brushed, all over patterning. As the patterning catches the sunlight, it reflects and refracts it, giving the work a sense of motion and visual appeal. A similar approach to brushed stainless steel was employed by the famous modernist sculptor David Smith in the 1960s and the kinetic sculptor George Ricky beginning in the 1970s. Quatrain was a collaboration between artists Edward Haugevik and Linda Spirit, who both have worked with steel throughout their careers. The commission for this piece arose when a trustee of SUNY Broome saw a solo exhibition of Haugevik’s work at a gallery in New York. With Quatrain, the sculptors created a work appropriate to a collegiate setting:the structure stretches toward the sky, much as the college offers a place for students to fulfill their potential by reaching for new heights of achievement. The work’s base and joints were deliberately de-emphasized in order to give the sculpture a sense of growing directly out of the earth, akin to the organic process of education. The upper end, which points toward the sky, offers a strong image of hope. 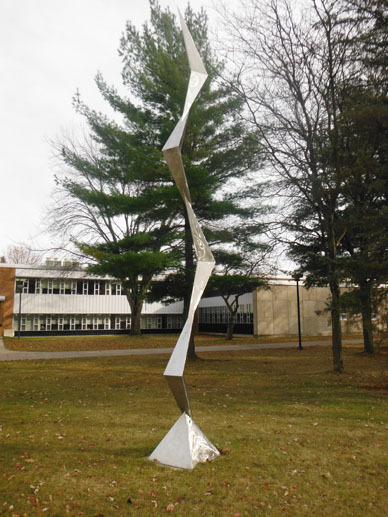 From the moment of its initial installation in Dickinson College (as it was known then), Don Walford’s The Object has remained a beloved symbol not only for the residents of Dickinson but for the entire student community of Binghamton University. Much of The Object’s long lasting appeal lies in its ability to engage the viewer on both cognitive and emotional levels: the abstractness of the work encourages analytic inspection, while its shape encourages climbing and sitting. The Object was completed in June 1967 by Walford, a Binghamton University student, as the final project for his Bachelor of Fine Arts degree. Walford’s first title for it was Construction No. 3, a name that reflects the sculpture’s relationship to the art movement that emerged in the mid-1960s and came to be known as Minimalism. Minimalist artists often used such plainspoken, engineering-like titles for their works; further, large scale, and use of repeated, basic geometric forms, and direct insertion into the environment are all features of Minimalism that The Object shares. The linkage between The Object and its environment is particularly important; even to the present day it remains a popular site for students to meet up, read, study, or chat while sitting on the sculpture. When The Object was formally acquired by the university in the fall of 1967, it was renamed Collegiate Structure. This renaming suggests university administrators might have aimed to associate the work with the pedagogical mission of the university, in such a reading, the interlocking beams of the work provide support to one another in order to buttress the entirety of the structure, similar to how the interdisciplinary environment of Binghamton University aims to provide a multifaceted education. In 1974, when Dickinson College was renamed Dickinson Community, The Object was also renamed, and given the title it holds today. Walford’s original structure comprised of discarded wooden railroad ties that, due to weathering, decayed over time. In 2009, the original wooden structure of The Object was demolished and recast in order to make the sculpture more resistant to the elements. 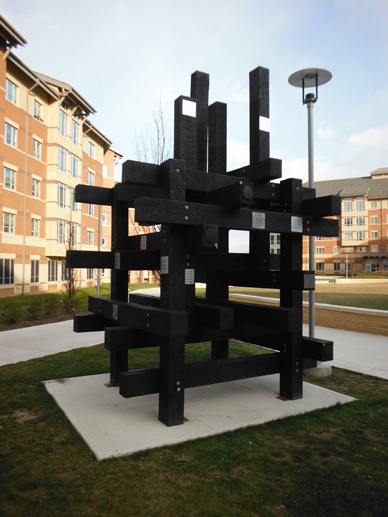 Walford has stayed in contact with the university, and oversaw the reconstruction of his artwork in 2009; he was also present at Binghamton University in 2013, when the sculpture was relocated to its current location, between the newly named Rafuse and Digman Halls as part of Dickinson Community’s move to a new set of buildings. Regardless its location on campus, however, The Object seems to retain its magnetic qualities. The sleek black set of bars invites one to sit for a while, whether alone or with others, and ruminate on the intersectionality that the piece and the campus both embody. Nathaniel Kaz was born in NYC; however, his family moved to Detroit when he was still an infant. It was in Detroit that he began practicing art and quickly became a recognized child prodigy at the age of 9. With his self-portrait, he took first prize at the Annual Michigan Art Show, defeating professional adults. At the age of 13, Kaz moved out on his own and studied art at Cooper Union under the direction of William Zorach and Aaron Ben-Schmuel. At 14, he worked in NYC reconstructing statues as a part of WPIA creative arts projects. By the age of 29, he had been an art instructor for 14 years. His work is permanently on display in the Metropolitan Museum, the Whitney Museum, and the Brooklyn Museum. He also won first prize in the United Nations contest to create a 60 foot sculpture to be erected in front of the U.N General Assembly building in 1955. Wisdom’s Triumph installation in 1960. In 1959, Nathaniel Kaz was commissioned to create a dignified symbol for the Binghamton University Campus. The Pegasus was his first work commissioned by a college. During its creation the piece was titled “Wisdom’s Triumph”. The winged horse is a symbol of enlightenment and overcoming the powers of ignorance. The Pegasus was depicted in a state of agitation to also symbolize the inner struggle to ascend with the muse. 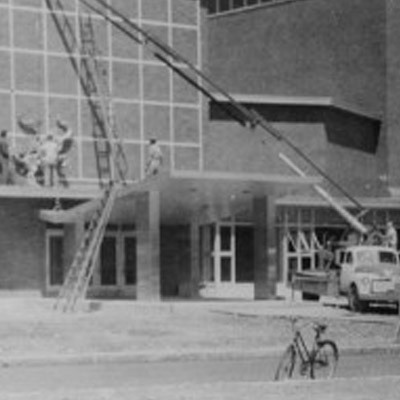 The artwork was dedicated on June 10th, 1960 and attached to the western façade of the Fine Arts Building. The Pegasus, a white horse with wings, is one of the most famous images from Greek mythology. According to the myth, a blow from the hooves of the Pegasus, caused the fountain of inspiration to spring from Mount Helicon, a mountain peak associated with the Muses—the spirits of dance, music, literature, and memory. 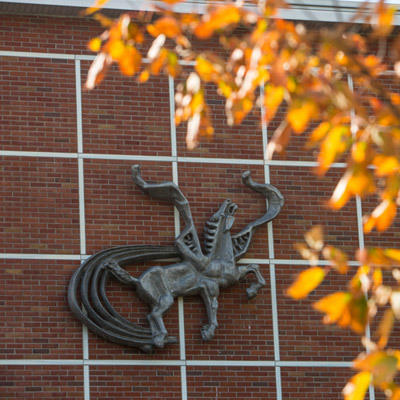 The Pegasus has also long been a symbol of enlightenment overcoming ignorance, which is one of the reasons it was chosen to be the official symbol of Binghamton University in the 1950s. The Pegasus is a frequent sight around campus, perhaps even more than the actual mascot of the bearcat. 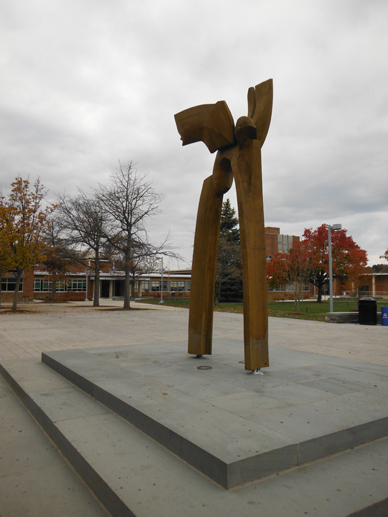 One of the most visible incarnations on campus is an abstracted, outdoor wooden sculpture located right in the center of the university’s “spine.” Pegasus was the result of a contest held by the Class of 1985 to choose the class gift for Binghamton University. The contest awarded a monetary prize to an artist with the best design for an outdoor sculpture that symbolized the spirit of the school; the winner was to be hand picked by a special committee. The committee, with representatives from the Senior Class Council, alumni, faculty, professional employees, and administration, chose Cornell University professor Roberto Bertoia’s proposal for an abstracted pegasus. The work took Bertoia ten months to construct; it was dedicated in the fall of 1987. Bertoia is known for his elegant, abstract sculptures, and wood is his primary medium. Pegasus was carved from rich teak wood, which was then bolted to a stainless steel frame and attached to a concrete base. The sculpture consists of an uneven arch that suggests a horse’s body and legs, on either side of which protrude angular, asymmetrical wings. The wings are open, as if in flight, with one horizontally orientated and the other posed vertically. The sculpture itself soars thirteen feet above its arched opening. 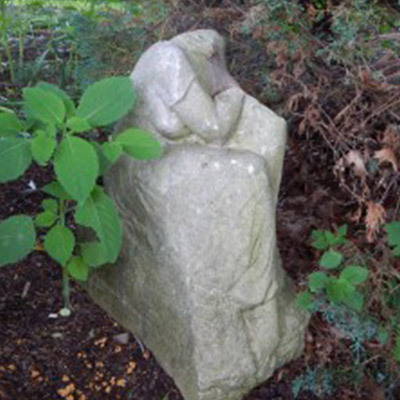 The sculpture has known several locations on campus. Its original location was chosen with the guidance of the Committee on the University Environment to be both aesthetically pleasing and environmentally unobtrusive. In 2012, Pegasus was moved to its current, central location in front of the Library Tower as part of an extensive reconfiguration to the campus’s main walkway. Its new location carefully places it at the intersection of two sightlines, one running north-south from the Library Tower to the Science buildings, and the other running east-west from the Student Union to Academic Building A. In its new locations Pegasus has become a place where students meet and congregate, sitting beneath its arch on the three stairs that make up its stacked square base. While a relatively new addition to campus, Pegasus has become more than just another incarnation of the campus symbol; rather, it is a true fixture, a work of art that students can “finally be proud of,” according to the student run newspaper Pipe Dream. This statue of Lady Justice has be credited to the architect of the Court House—Isaac G. Perry. However, until this day the actual artist remains unknown. 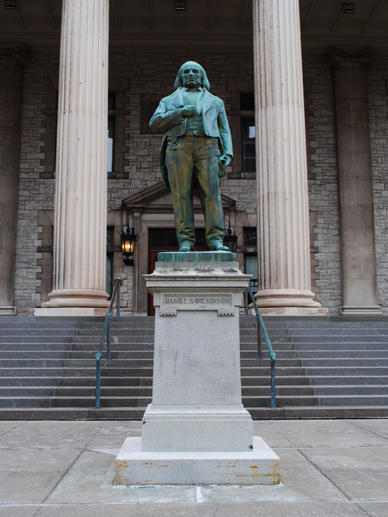 The 15-foot statue was brought to Binghamton and installed by the Edgar G. Freeman Company—Metal Works. The image of Lady Justice is a common symbol found across the globe with many different adaptations. But, she always symbolizes fair and balanced justice and the promise of swift penalty. Our lady is holding two iconic symbols: the scales (representing the balance of justice) and a sword (representing the enforcement of justice). In 1979, Lady Justice’s sword came loose from her hand, prompting officials to rope off the south west lawn for safety. Overnight, the sword fell harmlessly to the ground. It was restored to its position atop the dome and more securely attached to Lady Justice’s hand. 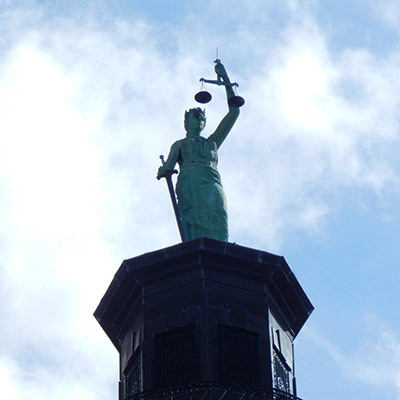 A unique feature of Broome’s Lady Justice is that she is not blindfolded, unlike virtually all other depictions of ‘blind justice’. The three female figures in William Zorach’s sculpture represent the Three Graces of Greek mythology — goddesses who traditionally symbolize charm, beauty, and fertility. Known in Greek as Charites (singular Charis), they were usually present at banquets and ceremonies to provide entertainment for guests. They were daughters of the god Zeus and the mermaid Eurynome, the latter a popular deity throughout the ancient Greek world. The Graces have long been a popular subject in Western art, appearing in works by artists such as Raphael, Peter Paul Rubens, and Sandro Botticelli (perhaps most famously in the latter’s 1482 painting Primavera). However, Zorach’s treatment of the theme differs from traditional interpretations. The Graces are often depicted in a way that emphasizes classical ideals, such as their sweetness and femininity, and are commonly portrayed as delicate and otherworldly; in contrast, Zorach’s figures are solid and powerful, emerging together from a single mass of bronze. Standing back to back with each facing out in a different direction and united by the holding of their hands, Zorach’s figures exude strength and confidence. “To me there is a revival of true sculptural values in the work being done today. Only time can give this art its ultimate value, but at least it is of our time and life and is of intense interest to any sculptor working today,” stated William Zorach in one of his books on sculpture. Zorach was a major modernist artist whose work appears in many major museums and collections including the Smithsonian American Art Museum in Washington, DC, and the Metropolitan Museum of Art and Radio City Music Hall in New York. Although he was trained as a painter and printmaker, sculpture was his primary medium. Zorach rejected extreme realism in sculpture as merely decorative and lacking “human spirit.” In contrast to the casting prevalent in his day, he preferred to carve his sculptures directly, mimicking the style of ancient Greek and Egyptian stone statues. Although Zorach was well known for his direct carving, The Three Graces happens to be one of his few cast-bronze works. Although the work was completed using the difficult lost-wax process (in which a mold is made of wax, heated, and melted to form a hollow bronze form), The Three Graces has all the forcefulness of Zorach’s better known carved pieces. 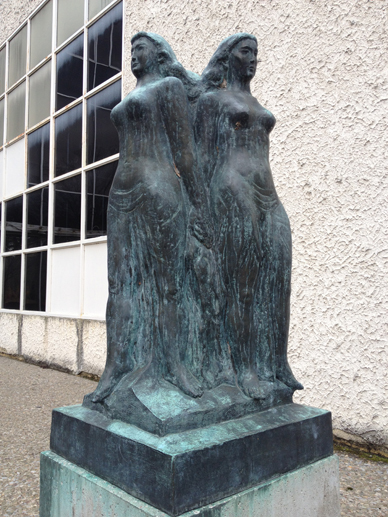 The Three Graces was a gift from the Civic Club of Binghamton to the Roberson Museum in honor of the Club’s 75th anniversary in 1973. 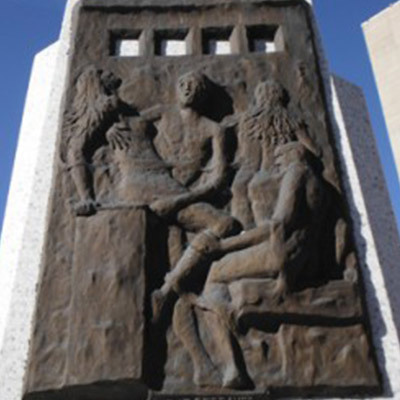 The Civic Club believed that The Three Graces embodied the theme of their anniversary, taken from a quote by Frank Lloyd Wright: “If you wisely invest in beauty, it will remain with you all the days of your life.” Tessim Zorach, the artist’s son, played an integral role in the securing of the work for the Museum, noting that his father would have wanted his work in a public space where many could enjoy it. The fountain and sculpture are flanked by buildings and the river wall and is a part of the East Bank River Promenade that was constructed in 1985. When construction of the South Promenade began, the pre-existing fountain was restored, the surrounding area was redesigned and a sculptural element was added. The fountain consisted of a circular pool with an underwater steel ring that released a cone shaped spray. The pool was constructed of a cast in place concrete with a brick cap and was flush with cast place concrete pavement scored in a radial pattern. Although the pool is no longer functional, you can see the concrete circle where it used to be. To the North of the circle is a curved cast in place concrete wall that reflects the shape of the pool. On top of the wall is a painted steel sculpture in the shape of a circle, mimicking the shape of the pool. Viewers standing above can look through the circle down the Chenango River to the confluence of the Chenango and the Susquehanna River. In 2011 a group (Emily, Sam and Susan Jablon, Kari Bayait, Anthony Santucci, and Chris Long) came together to bring the Promenade new life by incorporating mosaic tiles into the surrounding cement walls. With help from Kari Bayait, project originator, and the Southern Tier Celebrates organization which closed in 2010, this project became a reality. 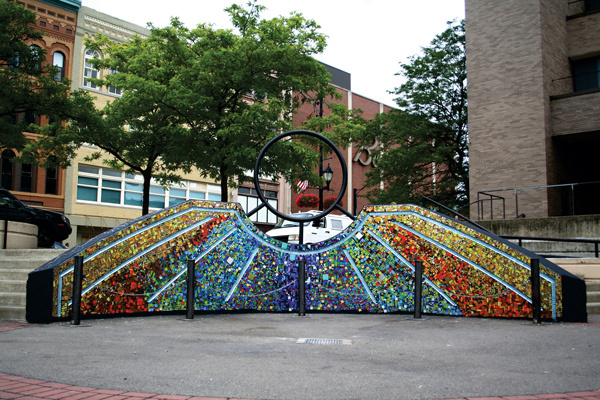 The glass tiles were donated by Susan Jablon Mosaics; the piece was the first mosaic done within downtown Binghamton. The inspiration for this piece was to bring color, joy and happiness to the city. This artistic group wanted people to take pride in Binghamton and this piece was meant to give them hope. Kinoshita was born in California but raised in Japan from infancy until the age of 15 when his family moved back to the United States. During World War II Kinoshita was imprisoned in an internment camp for Japanese Americans in Arkansas; he was granted leave from the camp when he became an interpreter for the United States Army. He later studied architecture and urban design at Cornell and Harvard Universities. In 1960s and ’70s Kinoshita became a highly successful landscape architect; perhaps most notably, he contributed designs for the plaza around Minoru Yamasaki’s original World Trade Center towers in Manhattan. He split his time between the United States and Japan, practicing painting along with landscape architecture and urban design. It was while working for Sasaki, Dawson & Demay (now Sasaki Associates) that Kinoshita came to work in Binghamton. 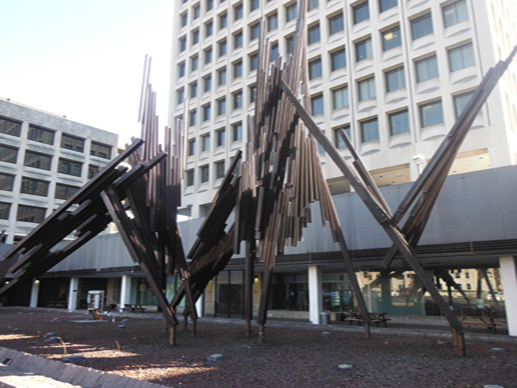 Kinoshita’s sculpture was a component of the firm’s design for Government Plaza downtown. Commissioned as a focal point for the plaza I-Beam comprises three separate structures, each rising 40 feet above a granite base. Corten steel wide flanged beams were welded together to form fanlike sculptural pieces. 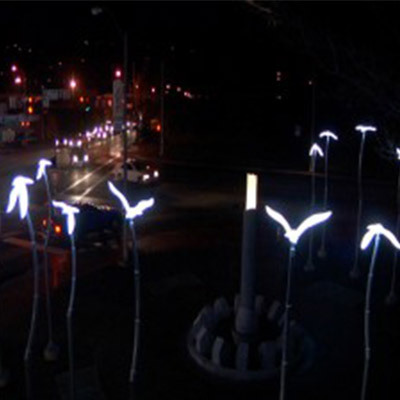 The ACA Memorial was commissioned by the city of Binghamton to honor the memories of those lost in a tragic shooting that took place at the American Civic Association Building in Binghamton on April 3, 2009. On that day, a local resident entered the building and, heavily armed, shot and killed thirteen people before turning the gun on himself. The tragedy shocked the region and indeed the country, given its national news coverage; it also traumatized the local immigrant community, which had long benefited from the language classes, social events, and other activities arranged by the ACA to assist recent arrivals to the area. The memorial offers a vision of healing meant to honor the memories of those lost in the attack. Completed in 2012, the project was the result of collaboration between Madeleine Cotts of BCK Architects and Engineers and project manager David Marsland, whose wife was one the thirteen victims. The pair envisioned a memorial that would convey the emotional trauma felt by the loved ones of the victims, capturing the diversity of those victims’ backgrounds, and provides a quiet space for reflection. ACA MemorialThe memorial is orientated around a broken column, alluding to the nineteenth century Victorian symbol – typically used to memorialize a life cut short. While evoking this Victorian practice, however, the memorial designers chose to add a translucent glass element rising from the column’s center in order to bring the attention to the present. On each of its nine sides the column bears a word or phrase of peace or non-violence in each of the nine native languages of the victims. Since its completion in 2013, the ACA memorial has been the site of multiple services on anniversaries of the attack. With its powerful imagery, the memorial literally illuminates the potential for a community to come together when clouded by the darkness of tragedy.